it industry today plays a vital role in the revenue of a country. at the same time adversely affects the health of the individual who works for this industry. long working hours, prolonged sitting, interaction with visual display unit and lack of adequate exercise are the main causes which produce different health problems in software professionals. eye strain, general fatigue, neck pain, back pain, head ache, body ache, stomach problem, blood pressure etc. are the primary difficulties they face. proper rest break, physical exercise, adequate sleep, and relaxation are beneficial strategies to solve these health problems. but only minority follows this strategy and in majority these primary difficulties end in different diseases. refractive error, acid peptic disease, migraine, cervical spondylitis, low back pain, hypertension andmany other ailments affect these individuals. like other parts of the body, the nervous system can often become overloaded with stress that can manifest in the body as pain, sickness and disease. ayurvedic massage therapy is one of the oldest healing method in the world and also the anti-dot to stress that causes problems in your nervous system..
all massage techniques stimulate the nervous system the body’s parasympathetic nervous system is responsible for feelings of peace, rest and wellbeing. different strokes and techniques in massage stimulate the nervous system and this in turn counteracts the exhausting stress and anxiety. the immune system is a network of organs, cells and molecules that work together to defend the body against attacks by foreign (not of the body) invaders such as germs, bacteria, viruses, parasites and fungi. in general terms, when antibodies are directed against the body's own cell an autoimmune disorder can result. autoimmune disorders are classified into two types, organ-specific (directed mainly at one organ like pancreas, thyroid gland etc.) and non-organ-specific (widely spread throughout the body like rheumatoid arthritis). if we have chosen the best doctor and best hospital, are we assured of maximal healing? the answer is a clear no, because all external drugs and procedures have to work through the ‘internal pharmacy’ of healing chemicals produced inside our body. invoking this internal healing power is called life style modification. if we are skillful in invigorating the internal healing chemicals, our need for external drug is minimized. mother nature prepares best foods for human bodies and it is your choice how you will eat them. appetites are learned and must consciously and conscientiously see the intelligence within. be natural, eat simple, eat the ‘common man’s’ diet and avoid packaged, sweetened, canned foods that might taste good, but are thieves that rob you of your natural vibrant health. cure for all ailments: the principles of ayurveda state that the beginning of curing all diseases and problems is making changes in the diet of the patient. the combination of these dietary rules with proper supplements is believed to remedy any problem. increased life span: adhering to this way of eating, you find balance between all tridosha; which means that your body and mind will be performing at its best. it also aids in the generation of new cells, and enhances the survival period of your existing cells. this will help you live a longer and healthier life. in hemantha the cold atmosphere brings about blockade to the dissipation of body heat which in turn increases the digestive power in strong men. in the sense, the cold atmosphere increases metabolism in our body to tide over the outside cold, this increases the need for food, this accelerates digestion. but in the absence of adequate fuel ( food supplements ) , this strong digestive fire persuaded by vayu, breaks down body tissues. so in hemantha, it is advisable to consume madhura (sweet ), amla ( sour ) and lavana ( salty ) rasas. 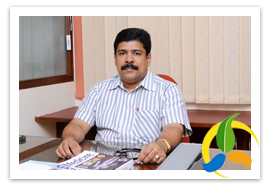 Dr Shaji Varghese BAMS, Managing Director. Renowned Physician in Ayurveda with vast experience in traditional Ayurvedic treatments, Panchakarma, Kerala special treatments, Body massage procedures and alternative therapies.